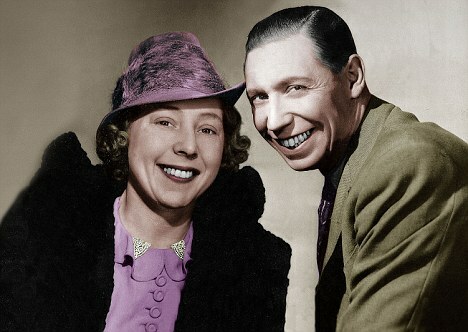 George Formby died 50 years ago this month, only 71 days after his domineering wife, Beryl, gave him the best Christmas present of his life by dying the previous December 25th. OK, but per Wiki, "In 1946 Beryl and George toured South Africa shortly before formal racial apartheid was introduced, where they refused to play racially-segregated venues. According to Formby's biographer, when George was cheered by a black audience after embracing a small black girl who had presented his wife with a box of chocolates, National Party leader Daniel François Malan (who later introduced apartheid) phoned to complain; Beryl replied "Why don't you piss off you horrible little man?" That's enough for me to forgive her for a lot. And the success she insured for George as his domineering business manager was his choice, so no midget violins here for George. And finally, if you're a GF fan like I am, don't miss Ralph Shaw's fabulous tribute show at this coming weekends' Reno-Tahoe 'Uke Fest in lovely Sparks, NV (info at www.playuke.net). Good stuff, if it's new to you take a look. Ron, how's about a link? It's YouTube, so just search on the words in the title. I'm afraid anything else is too high-tech for me, Gary.